As I was getting down to the stream near the Himalayan Adventure Institute I was happy to walk. There is something about the uneven mountain road, it immediately sets me at peace. I was completely engrossed in figuring out where to put my next feet for ten minutes or so! 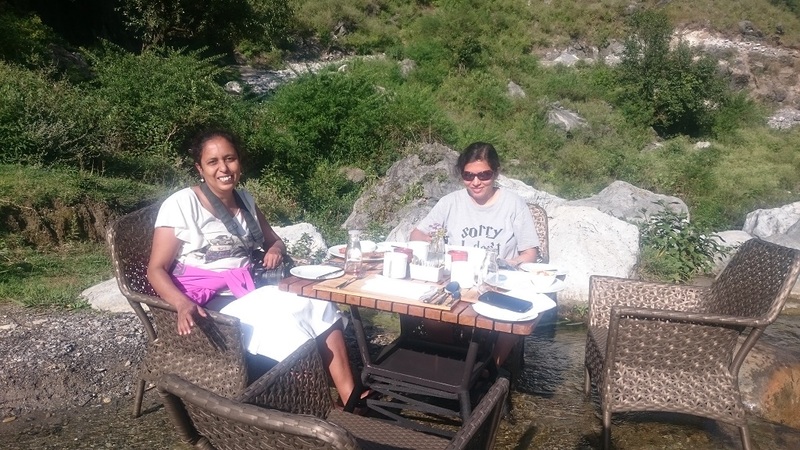 As I approached the end of the path, there it was, the grand setup of the breakfast by the stream by JW Marriott Mussoorie Walnut Grove Resort and Spa. Now I am no stranger to eating by the streams on my treks. But that means munching on a chocolate or eating packed lunch or breakfast! But here we were, standing in front of a breakfast spread beyond sumptuous. And what you see in the first picture is just a part of the entire setup. My next thought was that water would be cold! Having some acquaintance with mountain streams, I was not sure if I would be happy to put my feet in water for an extended period of time! The good people at JW Marriott Mussoorie had thought about it. At the foot of the table was a mesh that acted as a comfortable footrest. Neeraj was serving at our table. There were four tables in the stream. I asked Neeraj if he was a local to which he replied in affirmative. He was ever cheerful standing in the stream! Only a local can do it. The setting was so captivating that food took a secondary seat for a while. But then, I settled down to eat. I enjoyed the wonderfully done yogurt, carrot juice and walnut cakes. This trip was known as the #walnuttrail. 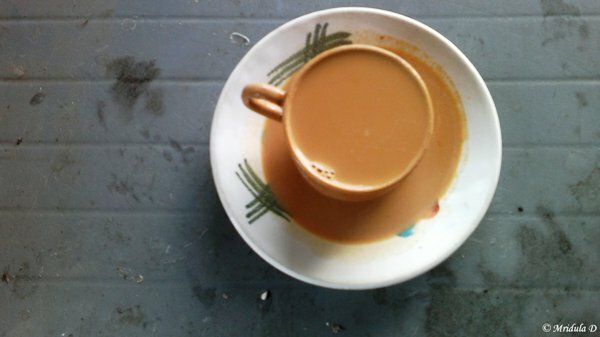 I washed it off with many cups of masala tea. However, the icing on the cake were the hot parathas served right in the middle of the stream! I stuffed on gobhi parathas and the local delicacy daal paratha. After coming back from the trip I have not gone anywhere near a weighing machine, I am sure I have gained weight! I stayed away from the weighing machine in the bathroom of the hotel as well! 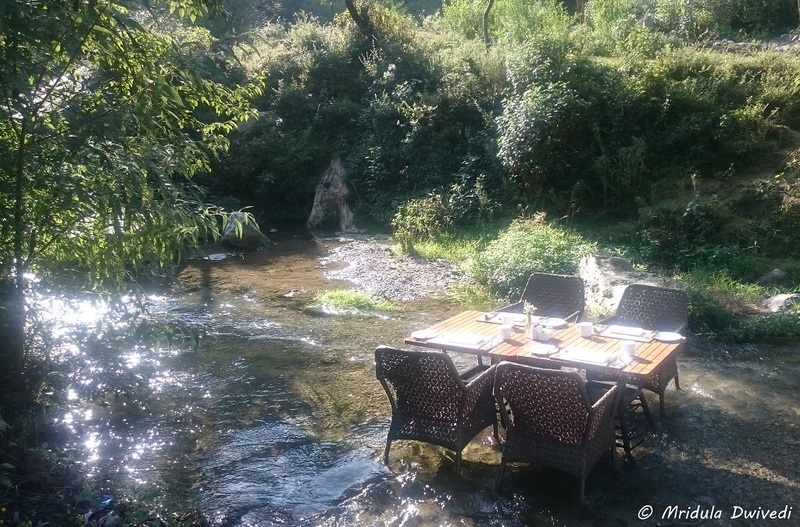 Many things about this trip that will get written, but the breakfast by the stream was extra special. JW Marriott Mussoorie Walnut Grove Resort and Spa can arrange it for the guests. 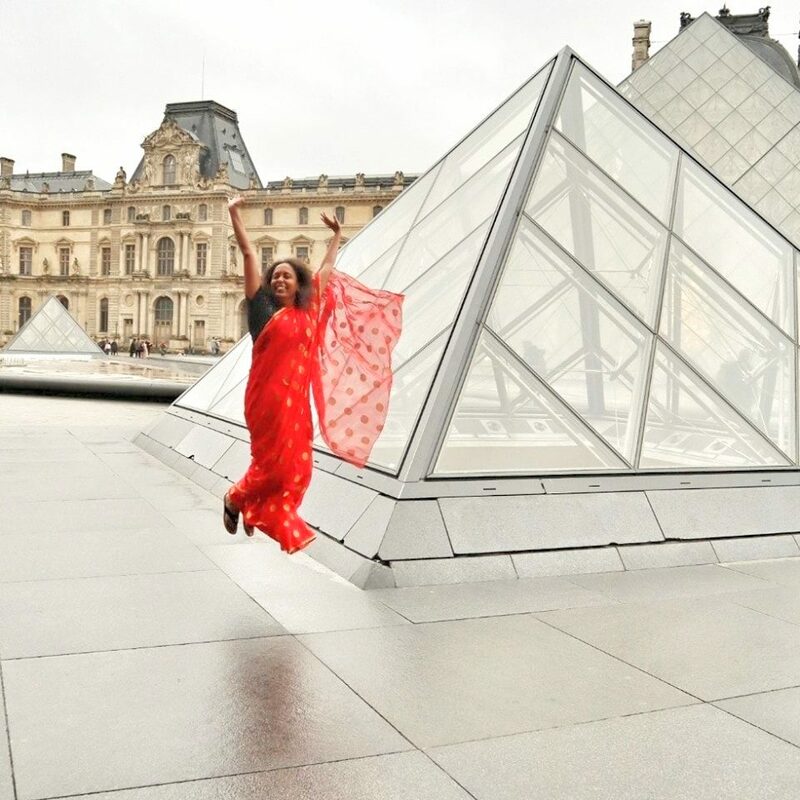 It is priced at 4500 Indian Rupees per person. Executive Chef Sunil and his team has come up with many such innovative dining ideas at the resort but for me the star was this setup of the breakfast by the stream. PS. I was invited by the resort on the walnut trail. While I was going to the Great Rann of Kutch from Mandvi, I asked My Siddiqui (the taxi owner and driver) to stop somewhere on the way for breakfast. A little ahead of Mandvi he stopped at a roadside stall and asked if I would eat something there. I had a small restaurant in my mind but I have no qualms about having a roadside breakfast. It is water that scares me more as I have had almost all waterborne disease in my childhood. And I am in no hurry to repeat the experience. I settled on Dhokla and tea. There were two stalls next to each-other on the road. There was a bench behind the stall where I planted myself. For tea, the person from this stall yelled to another person across the road who was making tea. While I was waiting, I realized it was a bus stop of sorts. Two young girls came and asked if the Bhuj bus had already left? When the answer was in the affirmative, they settled down on the nearby benches asking for some snacks. Before that there were people who actually managed to catch the 8.00 am Bhuj bus. The dhokla was surprisingly nice, the chilies contrary to their looks not too hot. Once I finished this lot they asked me if I would like to have some more? 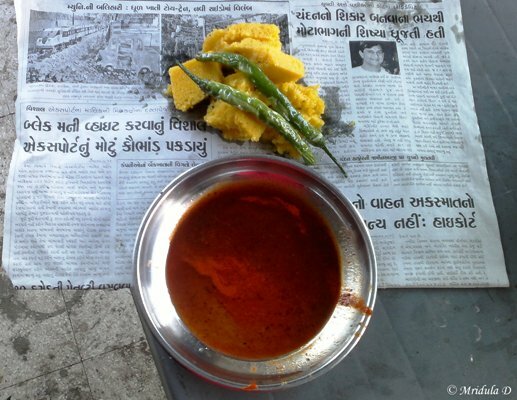 I am not a morning person at all, so I said thank you and declined even though the dhoklas were really good. Then came the tea vendor, with my tea in his kettle. He started filling up the up and I was wondering how tiny it was. I am used to mugs of tea rather than tiny cups. When he filled it to the brim, I reacted thinking it will spill over. Then I remembered that in Gujarat you were supposed to drink from the saucer and not the cup! I carefully sipped the overfull cup without spilling a drop, I needed all of it. It was surprisingly good tea, with less sugar, the way I like it. It was the kind of breakfast that you yearn for on a lazy Sunday when you are sitting at home on a quiet day.